Comfort Food Recipe No 1 – For a Rainy Day. Well, was that it? Summer? Yesterday Erik and myself worked our socks off in the garden. I started off wearing a camisole, T-shirt, jumper and fleece, but as the sun-shine grew brighter and the work harder, I was reduced to the camisole and T-shirt. Today, all is different. Let’s face it – this is England! Country of very definite seasons. I am sitting in my little upstairs office wearing woolly socks, thick denims, t-shirt and thick woolly jumper, and outside my window it is grey and wet. Very, very grey and very, very wet! But let’s think positive. All that lovely rain is needed, and will help bed in my newly planted fruit trees (more of those in a Kitchen Garden post). As usual my thoughts turn to food. Looking out of my window, every rain spot and every leaf blowing wildly past is calling out to me “Comfort Food. Comfort Food.” And guess what? I’ve found two great recipes that fill me with comfort just by looking at the pictures. Hope you feel the same. So here is the first Comfort Food Recipe. 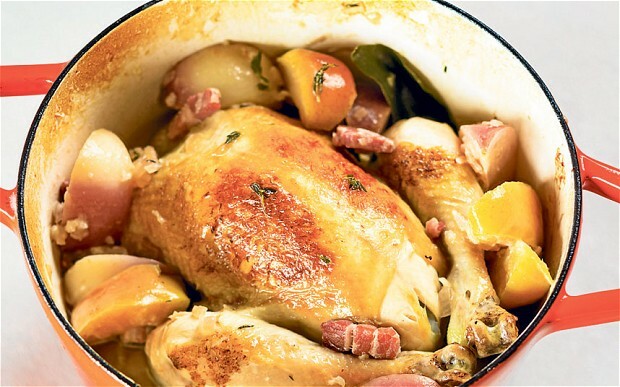 This recipe for Normandy Pot Roast Chicken with Cider and Creme Fraiche is definitely a comforting one. The particular recipe is from Stevie Parle of The Dock Kitchen, and I found it in the Telegraph. Hopefully Stevie won't mind if I put my own spin on it. I added a bit of good chicken stock for extra flavour, and instead of onions I used my favourite oval shallots, cut in half lengthways, plus added baby chanterelle carrots in with the chicken. Crispy Saute Potatoes or a big bowl of mash all add to that great homely flavour. Time wise, I cooked a 1.89kg chicken last night and it took about one hour 30 minutes to cook, then I rested it for 10 minutes under a loose piece of foil. It was perfect. Preheat the oven to 350F/180C/Gas4. Place a large casserole pan (with a lid) over a medium-high heat and add a good splash of oil. When the oil is hot, brown the chicken on all sides, then remove and put to one side for a moment. Add the lardons to the same pan, and turn the heat down slightly. Cook until they begin to colour and release their fat, then add the onions, butter and a pinch of salt. Cook for 6 minutes until the onions begin to soften and sweeten. Add the thyme, bay leaves and turnips and season well. Sit the chicken on top and pour over the cider. Season the chicken with salty and pepper. Cover with a lid and place in the oven for at least 45 minutes, basting the chicken occasionally. Stir in the apples and return to the oven for a further 20 minutes - without the lid on to crisp up the chicken. When the chicken is cooked through and its juices run clear, remove from the pan, let rest for 10 minutes then carve - into portions. Meanwhile stir the creme fraiche through the sauce, then return the chicken to the pan and serve with the turnips, apples and sauce. Comfort Food Recipe No 1 was taken from the Telegraph, and was the recipe by the brilliant young chef, Stevie Parle, of The Dock Kitchen. This is a restaurant I am looking forward to visiting in the not too distant future. Click on his name if you want to know more about this young chef. He will go far. Meanwhile, look out for Comfort Food Recipe No 2, which will follow this post after I have been downstairs to eat a big bowl of soup. It is still raining and very grey, so I need warmth.